Pomegranate is the fruit of the pomegranate tree, Punica granatum L., an evergreen plant which belongs to the botanical family Punicaceae, and reaches a height of about 4 meters. The pomegranate fruit is composed of many sacs which are filled with a flavorful pulp that varies in color from red to pink. pomegranate-medicinal-uses Properties of Pomegranate The contents of pomegranate are divided into two, the nutritional component and the non-nutritional component. • Pomegranate contains high carbohydrate which is higher than most fruits. It represents about 15.6% of its total content. • It also contains significant amounts of proteins, which represents about 1% of its total content. This is quite a reasonable amount since it is a fresh fruit. • Fats in pomegranate are negligible. The total fat content of pomegranate is less than 0.3% of its weight. • Pomegranate is significantly rich in vitamins such as vitamin E, C, and some B group vitamins. Important mineral lacking in pomegranate is pro-vitamin A, which is also known as beta-carotene. • Some minerals such as copper, iron, and potassium, are contained in pomegranate in abundant amounts. • Pomegranate contains citric acids and some organic acids which helps gives it its characteristic bitter-sweet taste. The presence of these acids also plays a role in the restoration of the intestinal bacterial flora. • Another important substance present in pomegranate in small amount are the tannins. Tannins have an anti-inflammatory as well as an astringent effect on the mucosa of the digestive tract. These tannins are usually found in the membranes that separate the seed sacs. 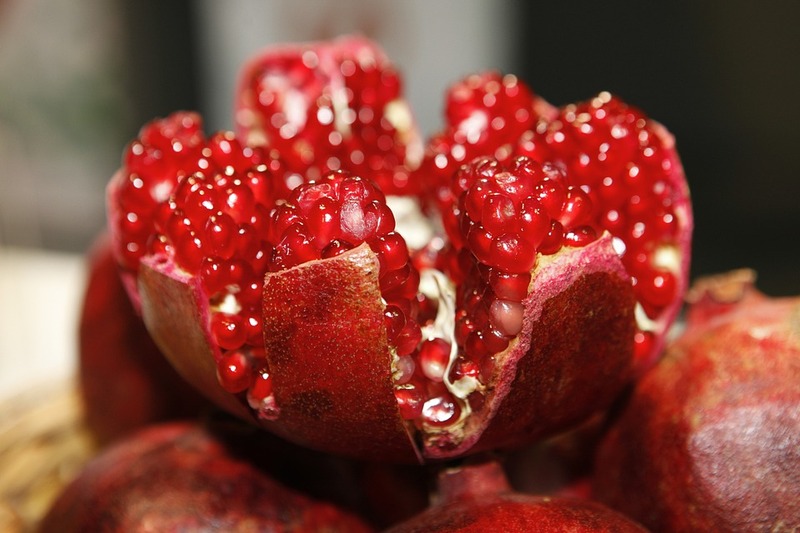 • An important substance also found in pomegranate is the Pelletierine. This substance is an alkanoid which helps get rid of intestinal parasites. • Anthocyanins are present in pomegranate as well. They mainly act as a diuretic, anti-inflammatory and antiseptics. Other functions of these pigments are stopping of aging process and cancerous degeneration, which is due to its antioxidant effect. • Vermifuge (eliminate intestinal parasites). • Anemia (Iron deficiency) – The consumption of pomegranate is highly recommended in cases of anemia caused by Iron deficiency. This is because it contains both copper and iron, the copper as a trace element facilitates the absorption of Iron into the blood. Its consumption in the following cases have been proved to be effective, as great results where obtained after treatment with pomegranate. • Hypertension – The fact that a high potassium and low sodium content is essential in treatment of hypertension, makes pomegranate is suitable food for hypertension patients. It contains high potassium content and virtually no sodium, thus, certifying the above fact. • Excess stomach acid – The astringent effect of pomegranate is responsible for this action. When there is an excess stomach acid, the consumption of pomegranate will be of immense benefit, as it will help reduce the production of gastric juice (which contains stomach acid that helps digest food materials), as well as reduce inflammation in the stomach. Pomegranate is a key ingredient in our Freedom, Cleanse, Restore herbal remedy pack.